Dr. Murugan Ramalingam is Professor at the Centre for Biomaterials, Cellular & Molecular Theranostics, VIT University, India. He hss also Adjunct Professor at the Tohoku University, Japan and Professeur des Universite at the Faculté de Chirurgie Dentaire, Université de Strasbourg, France. He has worked at the WPI Advanced Institute for Materials Research, Japan, as an Assistant Professor. He has also worked at the National Institute of Standards and Technology (NIST) and the National Institutes of Health (NIH), under the U.S. National Academies Associateship program. 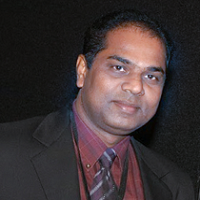 He received his Ph.D. in Biomaterials from the CSIR-Central Leather Research Institute, University of Madras. He has also undergone training in Ethical and Policy issues on Stem Cells from Harvard University, USA, and in Operations Management from the University of Illinois-Chicago. His current research interests are focused on the development of multiphase biomedical materials, through conventional to nanotechnology to biomimetic approaches, microfabrication and bioprinting, cell patterning, stem cell differentiation, tissue engineering and drug delivery. He is the author of ~300 publications, including 20 textbooks relevant to nanotechnology, biomaterials, stem cells, tissue engineering and regenerative medicine. His current h-index is 40 with ~9400 citations. He has delivered several keynote/invited talks and has chaired/organized several international conferences related to Biomaterials, Bioprinting, Nanobiotechnology, Stem Cells and Tissue Engineering. He also serves as a board member of several international scientific and research committees in various public and private bodies and grant reviewer of various international funding agencies. He serves on the editorial boards of multiple biomaterials and tissue engineering-related journals, including the Editor-in-Chief of the Journal of Biomaterials and Tissue Engineering and the Journal of Bionanoscience. He is a recipient of several prestigious fellowships and awards, including CSIR Fellowship (India), Singapore Millennium Fellowship (SMF) (Singapore), NRC National Academies Fellowship (USA), Nationale Professeur des Universités (France), Fellow of Royal Society of Biology (UK), Fellow of Institute of Nanotechnology (UK) and Fellow of Royal Society of Chemistry (UK).